van Genuchten, M. Th., F. J. Leij, and S. R. Yates. 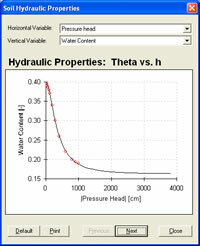 1991.
to represent the soil water retention curve, and the theoretical pore-size distribution models of Mualem (1976) and Burdine (1953) to predict the unsaturated hydraulic conductivity function from observed soil water retention data The program comes with a manual which gives a detailed discussion of the different analytical expressions used for quantifying the soil water retention and hydraulic conductivity functions. A brief review is also given of the nonlinear least-squares parameter optimization method used for estimating the unknown coefficients in the hydraulic models. 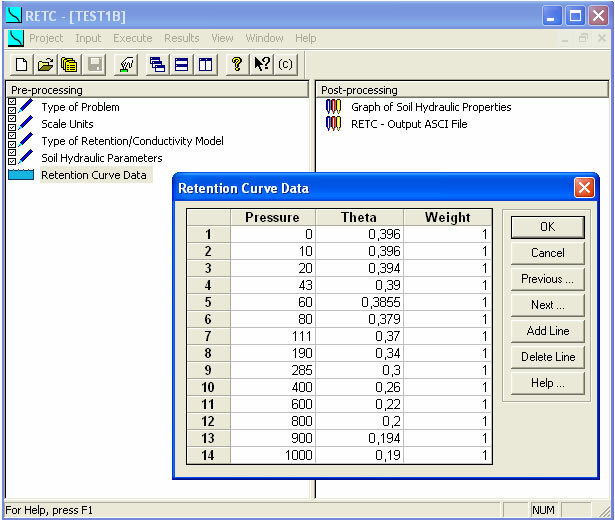 The RETC program may be used to predict the hydraulic conductivity from observed soil water retention data assuming that one observed conductivity value (not necessarily at saturation) is available. The program also permits one to fit analytical functions simultaneously to observed water retention and hydraulic conductivity data. 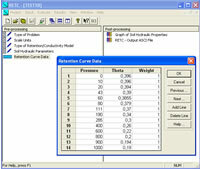 Several examples are presented to illustrate a variety of program options. The program comes with a user manual giving detailed information about the computer program along with instructions for data input preparation and listings of sample input and output files. A listing of the source code is also provided. .